this was my entery for TLM vs whatever their long name was. =] we lost. haha. I really expected to see a flood of Akira wallpapers, but nah. Also, I was apparently the only person to use the scond resolution(widescreen) allowed. I used a stock of a church from stock exchg, and three different scans from the Akira Gallery. Those who've watched the film will probably understand what I was going for. I have always found Akira to be a compelling movie and your wallie really shows his need to find his one self and how he became the 'person' he did in the end of the movie. Very sad. 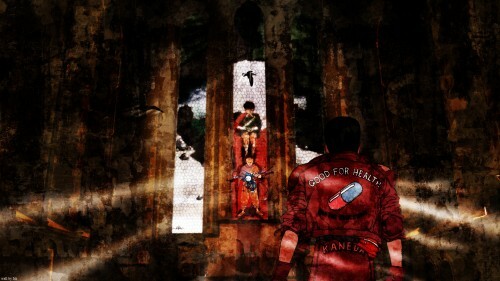 I like how you made Akira the stain glass. Everything started with him. Very nice detail. The bg has your style of grunge. The only thing is the blue thing in his hand. It sticks a bit in the wallie. But other than that, this is really good depiction. awesome wall! i liked how you did the conception of taking the two of them on the church, and the colors fits perfectly!